The Elements of Research -- Part Seven: Can You Reproduce It? Back in 1989, two scientists working out of the University of Utah claimed to have discovered a way to create nuclear fusion at room temperature. Once the supposed discovery was made public, hundreds of other scientists attempted to replicate the results. Eventually, their work was almost entirely discredited. See Wikipedia: Martin Fleischmann. The core of this scandal was the issue of a lack of reproducibility. I have been looking at a few of the entries in the FamilySearch.org Family Tree going back on some of my ancestral lines. My interest was to search for the Data Problems icons and see if they could be resolved. As you can see from the image reproduced above, I didn't have to spend a lot of time looking. I had already solved two such situations by doing some additional research when I ran into this one. The husband here is listed with six different wives and a total of 37 children. Most of these appear to be duplicates. What makes this even more interesting is that there 14 sources listed. If we did nothing more than count sources, we would have to believe that the research showed all 6 wives and all 37 children. It only takes a few seconds of review to discredit both the sources and the conclusions. What I find even more interesting is the he was christened 10 days before he was born! He was not only christened before he was born, his mother traveled about 331 miles to New York to have the unborn baby christened. He was not much of a traveler after he was born, since he supposedly died and was buried only 32 miles from his birthplace. As silly as it may seem, this example really points out an important lesson. If you are going to do research, in genealogy or any other subject, I suggest you may wish to learn to read and it wouldn't hurt to learn how to think either. I know. I am being very facetious, but facetious or not, there is an important thought component in the research process. Although Emerson observed that "a foolish consistency is the hobgoblin of little minds," despite that adage, consistency is the basis of reliably conducted research. Now back to cold fusion. If we publish our thoughts and conclusions before they are adequately supported by our documentation, we are putting ourselves into the position of those poor souls who believe in pre-natal christening. There seem to be untold minions of genealogists who believe that any record that mentions the name of an ancestor automatically proves its contents. In the case above, this type of conclusion extends to similar names also. 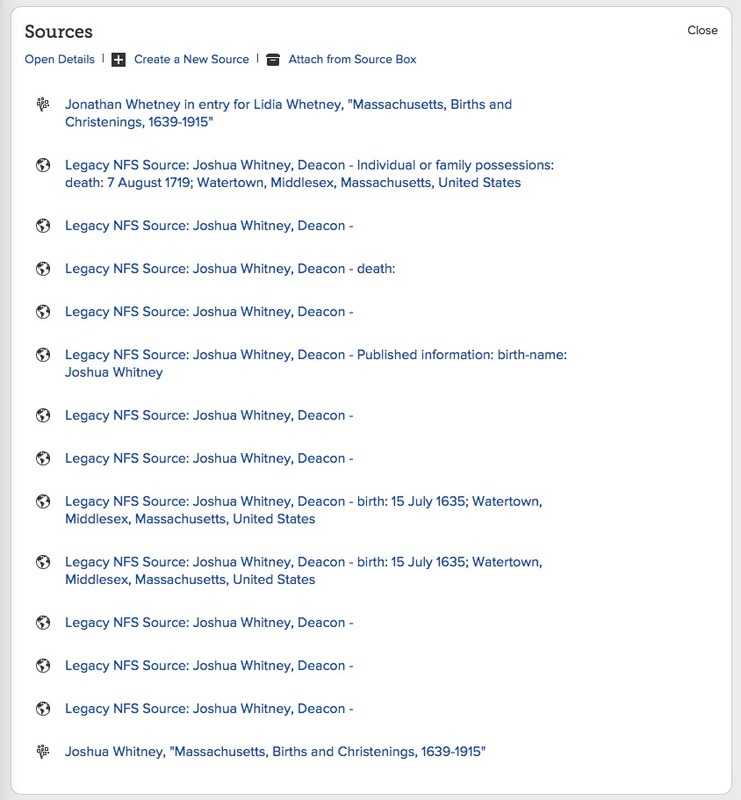 As a matter of note, I do not even know if I am related to this person, Joshua Whitney, since my own research on that particular line ends with Samuel Shepherd, b. 1732. I feel I must also point out the on the Family Tree, that particular line continues back a dozen or more generations to Sir Baldwinus DeWhitney, b. 1140 whose father's name is Emrys, b. 1120. Oops, I failed to see one more arrow with more generations, I am now back to the Earl of Eygos Exroy who was born before 1060. It is comforting to know that based on that unsubstantiated entry of Joshua Whitney, b. 1635, we can assume to go back on that shaky foundation all the way to the 11th Century. Oh, did I mention that Joshua Whitney's grandfather, Thomas A. Whitney, b. 1563, has 69 children by one wife and his father, John Whitney, b. 1592, had 48 children and 8 wives. Prolific ancestors, no wonder I have so many cousins. Let's just say that none of this has even a shred of resemblance to research. I note that there is not one substantiating source listed, legacy or otherwise, that connects any of these people together into a pedigree. Why am I writing all this about research? Apparently, there is a limited amount of it around and what there is hasn't seemed to make much of an impact on our greater genealogical community. Maybe that is the reason. The Elements of Research -- Part Six: When is Source not a Source? It may be true that a rose by any other name would smell as sweet, but does this apply to our use of terms in genealogy? We use a variety of terms when referring to genealogical research: facts, information, evidence, names, sources, records, collections, individuals, documents, books etc. Unfortunately, there are no commonly accepted definitions for any of these terms in the greater genealogical community. We are left to the definitions as they are represented by other genealogists, historians, the various websites, libraries and repositories. For this reason, I am not at all sure we can communicate well when we start talking about doing basic research. I would suggest that we need to focus on a term that refers to the basic unit of research such as the generic term "document." I would further assume that we can use the term "record" somewhat interchangeably. Of course both documents and records can take a variety of forms: oral histories, books, certificates, lists, transcripts, indexes, etc. They can also be presented in a variety of media formats, audio, video, text, books, microfilm, microfiche etc. Arguments over the meaning of a word can end up in huge, expensive lawsuits. In my own legal practice, one argument over the meaning of phrase in a document lasted for more than fifteen years and resulted in the filing of over thirty separate lawsuits. This is a good time to employ a hypothetical situation. Let's suppose we examine the 1900 United States Federal Census (or any other year). Is the entire U.S. Census a "document?" Do we consider each page of the U.S. Census to be a "document?" Is each entry on each page of the U.S. Census a "record?" Does this necessarily mean that the terms "document" and "record" are not interchangeable? Is each section of the U.S. Census gathered by each enumerator a separate "document?" If I poke around a little in all the books and articles about citation, I find that the "experts" recommend making a reference to the entire Census, the township, the ward, the sheet, the county, the Enumeration District, the family number, the state, the series, the line, the date, the roll and the image number. So is each of the entries so indicated a "record?" Is each entry a "document?" Because words are slippery, we need to be as clear and exact as possible. Requiring a complete citation is not "nit picking," it is merely a way to avoid the controversy of being imprecise. When we find a new piece of information about our ancestors, we need to record, not just the information, but the exact location where the information was found. By doing this, we turn a document or a record into a source. I will use the terms "record" (singular and plural) and "document" (again both singular and plural) to refer to a generic piece of written, audio, photographic (or whatever, carved in stone for that matter) information. So, a tombstone inscription is a document or a record. Likewise, a transcription or recording of an oral history is a document or a record. Any questions about that? There may be some residual issues about the difference between the information contained in the document or record and the physical item itself, but in this day of electronic documents and records, I assume that any ideological issues about whether a set of electronic impulses is a "document" are no longer an issue. I am also defining a "source" as the document or record where we obtain information about our family (or really anything else, but we are talking about genealogy, aren't we?) when that document or source is made part of a citation which is included with the information. To summarize, a document or record contains information. When I find that document or record and extract the information, the document or record becomes a source only when the precise location (citation) of the information is recorded along with the information. Hmm. That seems a little inelegant, but I think it is useful anyway. Why is it necessary to record the origin of the information before the record becomes a source? The answer to that question is the basis for this discussion about research. I assume that once you have done your "research" you wish to record and publish your findings, express your opinion, "prove your case" or whatever. In order for your conclusions to have any validity, they must be reproducible. I you say that your ancestor was born on a certain day, I should be able to go to the same record or document you used to derive that conclusion and come to the same conclusion. If you fail to make a record of the precise location where you found the information, then your conclusion is nothing more than an unsupported opinion. When is a source not a source? The answer should be that a source is only a source when it is recorded in a way that subsequent researchers can reproduce the process of finding and verifying the record or document's existence. What if I ask my Great Aunt Gertrude about her parents? What if she then dies? Is that information a source if I attribute the information to her? Is this true even if subsequent researchers cannot reproduce the information because she is now deceased? That raises the topic of another chapter. Is the reproducibility of the research essential to its validity? Can you argue that even if I didn't happen to write down where I got the information, it is still a source and my information may be valid? Yes, I suppose you can argue that all you want, but the lack of an attributed source means I have to do all of your research over again and come to my own conclusions. Note: There is a comment disputing the identity. Any other opinions? Don Lorenzo Hubbell (November 27, 1853 – November 12, 1930) was a 19th-century trader instrumental in promoting the sale of Navajo art. He was also sheriff of Apache County, Arizona, a member of the Arizona Territorial Legislature, and after statehood a member of the Arizona Senate. He ran unsuccessfully for the United States Senate in 1914. He spent his early years as a Spanish interpreter for the U.S. Army. He started a trading post in 1878 that became very successful financially. He eventually created an empire of 30 such trading posts in Arizona, New Mexico, and California. He helped many Navajos become economically self-sufficient by showing them the patterns of blankets most likely to sell for a profit. He was well respected in the Navajo community for his fair dealings with them. His 1878 trading post, now known as the Hubbell Trading Post National Historic Site, still stands on the Navajo reservation, and is a National Historic Landmark. Another trading post, purchased by Hubbell in Winslow, Arizona in 1921, is designated as the National Register of Historic Places listing. He is said to be the only caucasian buried on Navajo land. This photo was found in the Margaret Godfrey Jarvis Photographic Collection. The photos in this collection date back into 1860s. Most of the photos were taken by Margaret Godfrey Jarvis Overson or her father, Charles Godfrey DeFriez Jarvis. I would guess that most of the residents of Apache County are found in these photos between the years of 1880 to 1940 or so. I am in the process of uploading this entire historic collection to FamilySearch.org. You can find the photos by looking at Margaret Godfrey Jarvis Overson KWZZ-YBN or using the Memories find function and searching for "St. Johns" including the quotation marks. I am now commenting on Chapter 16: "Getting the Most from Electronic Indexes" by Suzanne Russo Adams, MA, AG. I fully realize that I have stretched this particular commentary over an extended period of time and it has been a while since I wrote my last post on the subject. However, I intend to finish the entire project. Chapter 16 is one of the few chapters that I entirely agree with. This chapter outlines some of the concerns that all genealogists face with using online websites and particularly in using indexes created by those websites. This is not a commentary on the accuracy of the FamilySearch Indexing program or any other program involving the complex task of indexing genealogical records, but it is a cautionary commentary on the reality of the limitations involved in those indexes. I think the following paragraph from the article gives an overall view of the issues involved. A history of the record sets you might find on the web, such as county or state vital record indexes and indexes to the census, might require a little genealogical sleuthing about where the records came from and how they were created, in order to better understand and utilize them. I would suggest that more than a little genealogical investigation as to the origin and content of the index is absolutely necessary. One example from FamilySearch.org is sufficient to illustrate this problem. If you examine the Historical Record Collections on FamilySearch.org carefully, you will find that there is an extreme discrepancy in some cases between the number of records reported and the number of records digitized. Although it is not spelled out directly, the record count given for each of the records, apparently reflects only the number of indexed records and not the number of total records in the collection. For example, a recently added collection is entitled "Czech Republic Church Books, 1552-1963." This particular collection is listed with 86,069 records. However, further investigation indicates that there are in fact 4,668,489 images. Obviously, the number of records actually indexed is only a small percentage of the total number of records in the collection. 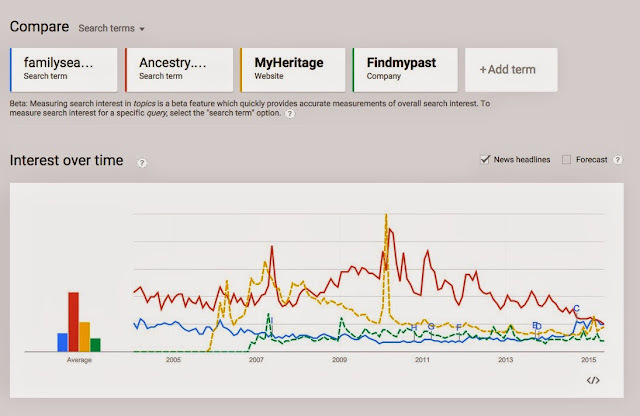 Using this example, any search on FamilySearch.org of this particular collection will in effect, only be searching a very small portion of the total number of records available. Until the records are completely indexed the only safe way to search this particular collection is to examine the records as if they were still microfilmed, as they actually are. In other words, the researcher must search the records individually. Fortunately, because the microfilm has been digitized it is readily available and searchable online for free. Those who are unaware of the situation and rely on the fact that there is a number of records indicated, will likely miss information. Unfortunately, FamilySearch does not tell the researcher which collections are only partially indexed in an obvious fashion. This, and many other problems and challenges of using indexes are carefully outlined in the current chapter under consideration. Another quote indicates clearly that the author understands the limitations of the indexing process. 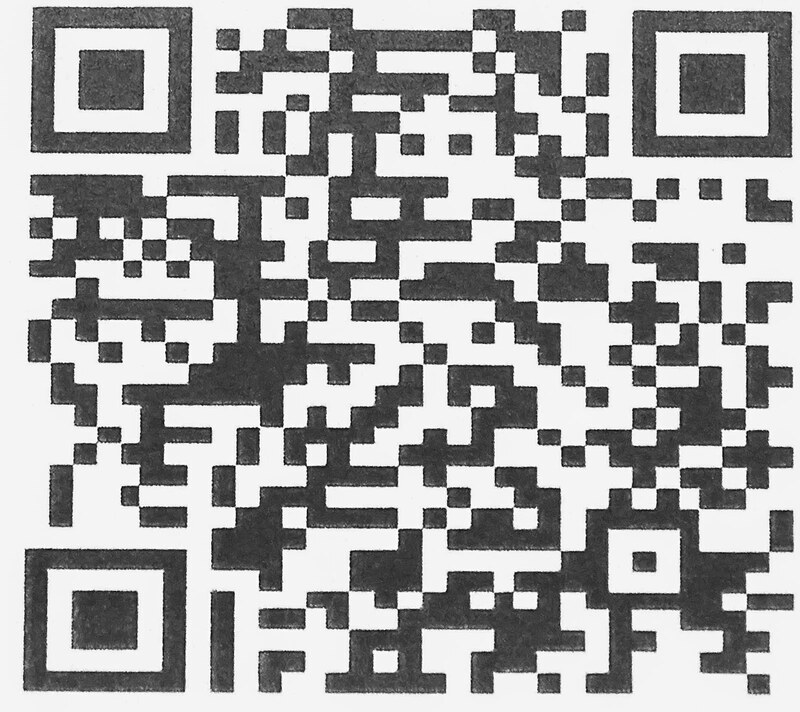 Due to continuing technological advances, it is becoming increasingly easier to connect a scan of an original source document to an index. When viewing indexes online, it is important to learn what information is contained on the original document and the "rules" for collecting that information. For example, enumerators of the U.S. federal censuses were instructed to record the state and/or country of birth for an individual. Thus, researchers should not expect to find the city of birth of an individual listed on an original census record or on an electronic federal census index. Moreover, researchers must understand which fields of information were indexed on a specific document in order to effectively use the index. The article continues with a summary of the various areas where the index may be limited due to the selection of the fields indexed and the information contained in those fields. The article also contains a short comment on the limitations of OCR transcribing. Although optical character recognition (OCR) has been being developed for some considerable period of time, there are still some obvious limitations. Some of those limitations are pointed out by the author and include the quality of the original image. One significant limitation of OCR transcriptions for genealogists is that any document that is handwritten is not yet able to be electronically transcribed except in very limited situations. This particular chapter is an excellent example of the value of this particular book. To begin your genealogical research, it is vitally important to understand the difference between methodology and theory. Doing research is not just a rote set of actions, it also requires a extensive realization of the end product of the endeavor. The researchers must resolve the question of what they are ultimately trying to accomplish. It is easy to get caught up in the mechanics of "doing your genealogy" and approach the subject as if it were nothing more than an exercise in filling in blanks on a form. The extreme example of this is the common practice of copying and adopting an existing pedigree without further examination, a practice that is also called "name gathering." Methodology is the systematic use of procedures and actions. To be effective, any methodology must be directed by an overall understanding or "theory," that is, a system of ideas and understanding based on general principles. I am not using the concept of a "theory" in the scientific sense of a hypothesis, but in the general sense of an idea used to substantiate the need for a specific action. By writing about research, I am intending to investigate the limits and bounds of what is and what is not genealogical research. This investigation comprises my "theory" of genealogical research. At the same time, I am formulating a series of methodologies that support my overall genealogical theory. I begin with this example because in my experience, it has not been uncommon that a beginning researcher did not know the identity of his or her parents or only knew the identity of one parent. Genealogists acknowledge this possibility with the categories of adopted, foster, guardian and grandparent relationships. The ultimate reality of genealogical research is that the consideration of actual biological relationship is in question at every single step in the ancestral or relational links. For example, are you sure that you or some or all of your siblings were not adopted? As a side note, in the United States, the existence of a "birth certificate" is not conclusive as to a biological relationship. In many cases, the adopted child has been provided with a birth certificate showing the adopted parents as their "biological" parents. There is a serious issue concerning what is actually known about our ancestry. Unfortunately, relying on sources is not an absolute guarantee of accuracy. This difficulty is generally analogous to what is known as the Uncertainty Principle in science. Just as there are limits to the degree of precision available in the scientific world, there is a concomitant limit to the accuracy of any historical research; we are always limited by the accuracy and availability of historical records. Although, I must observe that we can achieve a far greater degree of accuracy and precision than is commonly demonstrated in genealogical research. Back to the issue of methodology vs. theory. Much of what is taught about genealogy involves methodology. For example, there are hundreds, if not thousands, of classes taught about "how to organize" your genealogy. Another example is the abundance of "tutorials" on the various genealogically related programs. There is an assumption that knowing how to use a certain program will enable you to "do your genealogy." If genealogical research were nothing more than methodology, then it would be relatively simple to create a computer program that would automatically provide each person with their own genealogy. Despite the fact that there are programs out there that purport to do just that, the reality is that those programs, of necessity, are based on inaccurate and incomplete data. Until and unless computer programs can replicate the activity of the human brain, human evaluation of the products of computer programming research will always be needed. If you are related to your mother and your father, you too are a victim of pedigree collapse. Pedigree collapse is a basic principle of ancestry. The definition of this condition is a little complex. Essentially, some of your ancestors married their own relatives. As you go back in time, this intermarriage becomes more and more prevalent. The effect of the intermarriage is that the number of your ancestors does not actually increase in a regular geometric progression (i.e. 2, 4, 8, 16, etc. ), but instead, at some point in the past, the numbers actually begin to decrease dramatically. If you were to view your pedigree in a diagram, the resultant image would look similar to a snake that had swallowed a mouse whole. The number of persons in your family lines would increase to a point in time and then begin to decrease. If the geometric progression of your ancestors was a reality, in about 30 generations, you would have more theoretical ancestors than the entire population of the world. In my own case, this phenomena began with my own parents, who were 2nd cousins, that is, they shared the same great-grandparents. Another obvious fact is that the smaller the ancestral community, the more likely it will be that your ancestors married their own cousins. Pedigree collapse is more common among populations where transportation was limited or in small isolated populations, such as islands. If you want and current graphic example of pedigree collapse, you can enter your ancestry into the FamilySearch.org Family Tree program and then use the Relative Finder app to see all your relatives. You may find out that you are related to your spouse. What do you already know about your family? This is not a question to be addressed casually if you are beginning your family history research or even if you have been researching for many years. Yesterday, I spent a couple of hours with one of my friends working on his family lines in the FamilySearch.org Family Tree. He began by showing me his ancestors back seven or eight generations and looking at names and more names. He had no idea where to start or what to do. I find this to be an extremely common situation. Genealogical research can very quickly involve very large numbers of ancestors. The geometric sequence progression of direct line ancestors illustrates this perfectly: 2, 4, 8, 16, 32, 64, 128, 256 etc. My friend was looking back at a level where he had over 500 (510 to be more exact) ancestors. When you consider that many of these ancestors had more than one spouse, practically, the number was even greater. What was the problem here? He thought he was ready to research some of his remote ancestors when he had serious data problems my closer to the present. After going back to his parents and grandparents, we found a situation where one of his great-grandmothers supposedly had her first child when she was five years old. We spent the rest of the time looking at this one family. When we say that research begins with the known and moves to the unknown, we mean it. The accuracy of each successive generation is based entirely on the accuracy of the data about the one that is more recent in time. Jumping back into time to do "research" almost guarantees that you are researching the wrong people. This does not mean that a single line cannot be accurately extended, what it does mean is that moving back generations without doing the fundamental groundwork for each intervening generation is ill-advised. So, do we take out aunt's or grandmother's word that everything she put in her pedigree was the gospel truth? Not unless you want to find out later that you were building a bridge in the air without any support. I have been working on my family lines for over 30 years and I am just now beginning to sort out the lines where the controversy begins with the families of two great-great-grandfathers. In my case, most of the information "passed down" from my family was inaccurate. When I say this, I mean the people were not properly identified, not that there were simply errors in the dates etc. the identity of the people listed was and is in question. In many cases, it is easy to determine where to start because the pedigree is incomplete in the first four generations or is almost entirely lacking in supporting source documentation. The main question to ask at this point is whether or not the researcher is actually interested in doing research. The reactions I get to my comments about the status of the information they have already gathered is usually indicative of whether or not they are willing to begin to do research or are merely passively interested is seeing names on a pedigree. I look at the starting point in terms of geographic locations. My questions involve discovering a trail of established, verified, specific geographic locations that are associated with events in the family tree. The reason for this position is simple. Genealogically pertinent records are associated with specific geographic locations. 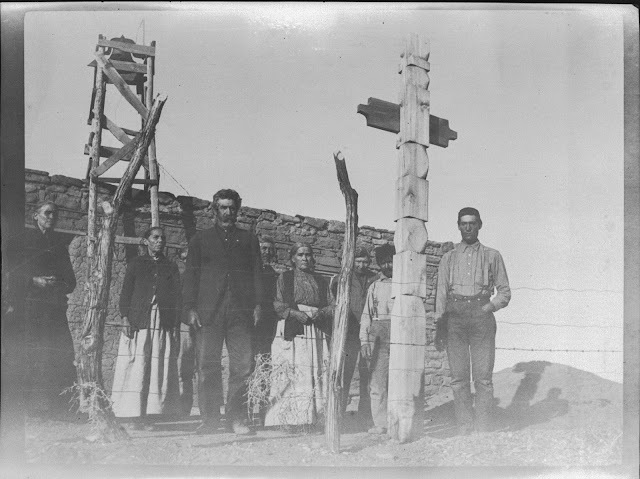 Depending on the family and the location, this identification may need to be down to the specific house, farm or ranch the family lived in or on. This is particularly true when you have people with the same or similar names in the area. Examine your family lines carefully. Look for documentation with valid sources for the information recorded for each individual. Look for consistency in dates, places and names. Choose a specific line for investigation. Verify each place and the associated records where the recorded events occurred. Begin your research at the point where the names, dates and places begin to be partially recorded or missing. Most of the time, this process takes me about ten to fifteen minutes before I have found serious data problems. Before I go any further with this series on research, I need to discuss the concept of "sources." The entire idea of researching genealogy is built on an assumption, proven in fact, that various individuals and organizations keep records and have done so for thousands of years. Whatever the motivational interest, records have been kept from individuals writing letters and diaries, to commercial operations, to national governments keeping track of their armies and treasuries. Some of the oldest writing in the world was used to record grain and livestock transactions. See The British Museum, Explore/Writing. It took thousands of years before writing became so pervasive that records existed about the lives of individuals, outside of royalty and other important people. The earliest records of most of our ancestors only go back as far as the 16th Century although tax records go back much further, such as the Domesday Book, compiled in England in 1085 for the purpose of determining what taxes were owed at the time. With the advances in printing and literacy, eventually, records accumulated at every possible jurisdictional and societal level. To genealogists, these written records (and occasionally oral ones) are the source for the information that goes into compiling a family tree. Discovering these records is the main activity of genealogists. A record becomes your "source" for genealogical information when it contains information about your family. Basic genealogical references are guides to where these records may be found and how to use them to compile family histories. For example, one basic book about genealogy in the United States is called simply, The Source, A Guidebook of American Genealogy. (See Szucs, Loretto Dennis, and Sandra Hargreaves Luebking. The Source: A Guidebook of American Genealogy. Provo, UT: Ancestry, 2006). This book is primarily an explanation of what kinds of genealogically important records are available and where they might be found. Records have been preserved for a variety of reasons including being preserved specifically for genealogical research. Today we have entire libraries dedicated to the preservation and dissemination of genealogically important records. As computers and the Internet became the central way information is disseminated, large online collections of genealogically important records became the main place where genealogists began their research. Because of the advantages that accrue from access to digitized records available to individual computing devices, the number and variety of these online records has become a virtual explosion of information. As the number of records online has increased, genealogists have attempted to keep pace with the number of records by creating catalogs, lists and wikis that attempt to organize these huge collections. Notwithstanding the huge amount of information already online and the vast amounts being added daily, there is still an even greater amount of genealogically pertinent information locked up in the world's paper-based, written records. If the basic genealogical activity is discovering records that pertain to family history, it is important to distinguish between the quality of the information found and the quantity. Quoting from a commonly used genealogical course book, (Harland, Derek. Genealogical Research Standards. Salt Lake City, Utah: Published by the Genealogical Society, the Church of Jesus Christ of Latter-day Saints, 1963, p. 19). Far too many so-called genealogists judge success in research by the number names they have collected in their searches, rather than by the method and approach to the genealogical problem and the care with which the search ave been made. "Name gathering" is not genealogy. The information contained in various records may well be inaccurately recorded, contradictory and in many cases, entirely misleading. The process of becoming a competent genealogist or family historian is essentially an evolution from blindingly copying information to incorporating methodologies for interpretation and evaluation. A genealogical researcher first must identify and find the records. But at this point, the research process has just barely begun. Records do not exist in isolation, they must be interpreted in context. It is all too easy to find a name in a record and immediately assume that the named person is your ancestor. It is only by careful analysis of the record, its context and possible limitations, that you can safely assume the record is pertinent. In addition, as I alluded to previously, any inconsistencies and contradictions in different records must be resolved. When a record is appropriately evaluated and any issues with the record resolved, then the record should be incorporated into an organized structure so that the researcher and any other member of the family can see where the information was obtained. Maintaining a "source-centric" family history means that every fact is supported by a reference to a record (source) where the information was obtained. Fortunately, for many beginning researchers, this task has become fairly simple. 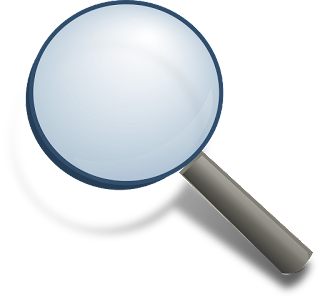 Several of the large online, genealogical database programs have incorporated methods of automatically searching for pertinent records and then attaching them as sources to the appropriate individuals. The part of this newly developed automatic system that cannot be supplied by the online providers is the evaluation and resolution of the inconsistencies and mistakes in the original records. Although the results of these online, automated searches can be amazing, they can also be entirely wrong. When I say I am doing genealogical research, what am I doing? The answer to this question is, to some extent, highly personal. But there is a general consensus. Genealogical research is primarily an activity involved in identifying and searching records. Any record found to contain genealogically pertinent information can become a source through proper evaluation and interpretation. Any information recorded in the family history derived from that "source" should be attributed to the record through a process of citation. It is important that these "citations" contain enough information that the research and any subsequent researchers can readily identify and locate the original record. One major advantage of the online, automatic or semi-automatic record hinting programs is that the citation to the record, once incorporated by the researcher into a family tree, is preserved with a link to an image of the original record. As a side note, presently, in many cases, there exists the capability to electronically attach digitized copies of the original source record. This should be a mandatory and consistent research method. Any time it is at all possible copies of all original records should accompany the citation attached to any family or individual. Well, at this point, I have gotten a start to analyzing and commenting on the research process. Stay tuned for future installments. When students of genealogy first learn that it is impossible to prove a lineage absolutely, they resist that fact. They live in an era when advanced technology demands absolutes, the products of societies driven to achieve perfection. Neither resistance, technology, nor the pursuit of perfection will alter reality; at best, a lineage can be proven only beyond a reasonable doubt, just as guilt or innocence is proven in a court of law. Lineages, like court cases, are built upon available evidence. I will reserve further comment on the issue of applying legal jargon to genealogical research issues to another post, but I would comment here that proving genealogical research to a standard of "beyond a reasonable doubt" would make that research practically impossible. This statement above, to some extent, summarizes my comments in the first installment of this series. Proving an ancestral relationship with "evidence" implies a degree of certitude that is not achievable. Court cases involve adversarial proceedings presided over by a judge or jury who will ultimately make the decision as to which side prevails. There are no genealogical courts, either are there any genealogical judges or juries. The end product of our genealogical research is nothing more or less that a series of conclusions we make based on the sources we discover. Nothing is added to the research process by alluding to any quasi-legal standard of proof. It would be difficult to set a general standard for genealogical research, as the methods of compiling pedigrees vary according to the time and locality of each problem. The aim of every genealogist is to conform to the highest standard, irrespective of the time and locality of the problem – it is to carry out searches that will result in complete and correct and connected records. Each one of us who would undertake to compile a genealogy is in duty bound to base this record upon the testimony of persons who actually knew from first-hand experience those facts of names, dates, places and relationships which go to make up such a record. Or, in the event no direct, first-hand testimony of an eye and ear witness can be found, he must obtain the testimony of one who, although not himself an actual witness to these facts, learned of them from those who did know by personal experience. The key concept I see as crucial to beginning a study of the subject of genealogical research is the concept of moving from the known to the unknown. Before we begin to search for information about our remote ancestors we most certainly need to understand clearly what we already know. This particular stage has been referred to as the "Survey Stage" of genealogical research. In my early years, this process involved years of research in the Family History Library in Salt Lake City, Utah gathering all of the records previously compiled by my relatives. Today, that task is made considerably easier by the availability of much of that information online. All too often after accumulating the efforts of other family members, researchers began by accepting on blind faith the work done. Obviously, such work may have been accurate but in many cases, there are discrepancies that can seriously affect the accuracy of subsequent research efforts. Many of these earlier compiled genealogies lack any reference to the source where the information was obtained and are therefore inherently unreliable. It may seem unnecessary bother to document information that we "know" to be correct but had our ancestors done this, we would not be in the position of having to redo the research. We begin the process by understanding the need for source documentation as a basis for extending and verifying family lines. Before initiating a search for individuals and families, it is imperative to understand the relationship between locations and sources. Any valid genealogical or historical investigation is source-centric. But at the same time, any consideration of sources need to be focused on specifically identified geographic locations. It is essential that we verify information we already possess. In the process of verifying my own family's efforts, I found much of the information to be inaccurate. Place names were improperly recorded or totally inaccurate. Dates were often missing or obviously wrong. Names were expelled in a variety of formats and variations in the names were not reflected in any actual records. I found incorrect places and dates, thereby rendering whole ancestral lines questionable. All of the previously recorded sources must be analyzed and evaluated for consistency and accuracy. At this point, it is important to proceed systematically, making no assumptions and refraining from the impulse to jump back to research missing information. For example, if a particular ancestor has no source documentation, approximate dates and unspecified places where events occurred, it should be assumed that any recorded ancestral lines beyond the unverified individual are questionable and should be ignored until adequate documentation is discovered. Research, therefore, is the process of evaluating what is presently known, identifying questions that need to be resolved and missing information that needs to be found and then beginning the process of analysis and interpretation extending the lines by considering sources that may be available as connected to the places where our ancestors lived. Too many people, when beginning genealogical research, assume that all they need to is look for records and copy out the names. I will expand on this idea in future installments. For some time now, I have been thinking about the concept of genealogical research. In order to further my thought process and organize my thinking, I have decided to begin a series analyzing and explaining the basic research processes as it pertains to genealogy's particular area of historic research. Obviously, as usual, this analysis and the accompanying explanations will be highly personal. In order to begin to organize my thoughts on the subject, I used the following book written, in part, by my friend Arlene Eakle. Cerny, Johni, and Arlene H. Eakle. 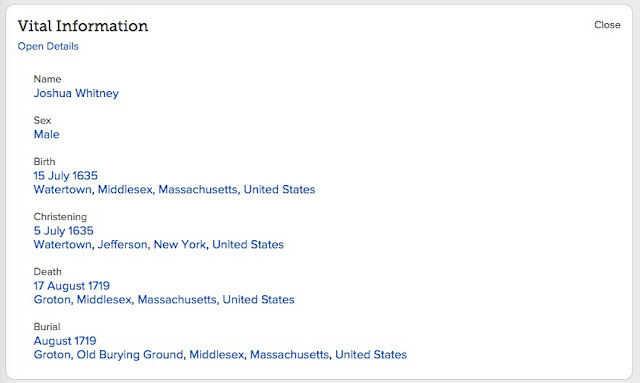 Ancestry's Guide to Research: Case Studies in American Genealogy. Salt Lake City, Utah: Ancestry Inc, 1985. I do not intend to review the book, but I do intend to use the concepts contained in the book as a structure for addressing the current concepts of genealogical research. As I go along, I will add additional, more recently, published books. I may also refer to other even older books along the way. Since my very first attempts at historical research, in high school, over fifty years ago, I have been actively involved in research in some form or another. But simply doing research does not necessarily give someone the insight to analyze and understand the process. For quite some time now, I have been reading and studying the methodology and processes involved in discovering family relationships. Of course, my years of active participation as a trial attorney have also influenced by thinking. I have written several blog posts about my impressions of the current state of genealogical research. The thrust of my concerns involve the fact that current genealogical methodology and analysis has become almost hopelessly tangled with concepts and jargon borrowed from both law and science. I am almost in despair at the task of separating the intermeshed and inappropriate legal and scientific concepts from from the core concepts of genealogical research. The current common adoption of the terms "facts," "evidence" and "proof" in talking about historical research is the most obvious indication of this integration. Historically, these terms were used in a general sense, but during the very recent past, the terms have definitely adopted a quasi-legal connotation. When did genealogists begin incorporating legal and scientific jargon into their writings? If you read the following book, you will not find any reference to "proof" as such or to the more current concept of a "proof statement." Harland, Derek. Genealogical Research Standards. Salt Lake City, Utah: Published by the Genealogical Society, the Church of Jesus Christ of Latter-day Saints, 1963. Harland does discuss the concept of evidence, but uses the term in a general way and does not try to relate the term to legal terms. By 1985, the Ancestry book, cited above, makes reference to a "preponderance of the evidence," a term directly borrowed from legal jargon. Bennett, Archibald F. A Guide for Genealogical Research. [Salt Lake City]: Genealogical Society of the Church of Jesus Christ of Latter-Day Saints, 1951.
the concepts of proof and evidence pre-date any attempted relationship to the use of these terms in the legal sense. It is not use of the terms, per se, that I find objectionable, but the implication that they are validated by their incorporation as quasi-legal terms. This culminates in the present assumed ability "advanced genealogists" supposedly acquire to write acceptable "proof statements," which are nothing more or less than their personal conclusions couched in quasi-legal jargon. From my standpoint, this is exactly the same as relying on the briefs submitted by one side in a legal controversy with weight being given to the formality of the statement, more than the content and research supporting the arguments made. After writing legal briefs for years, perhaps I resent the implication that my genealogical research is only acceptable if I follow quasi-legal guidelines and prove my genealogical case. If I believed that a "proof statement" was necessary, I would become fundamentally exclusionary and adversarial. In writing about the subject of research, I will try to avoid the currently popular terminology and rely on the more traditional methods of describing genealogical research. I will also try to go well beyond the present issues of terminology and address a more thorough methodology for conducting research. I will begin demonstrating my line of thought with this example. I recently became involved in researching one family line of immigrants from England and Wales. Nearly all of my other family lines have been exhaustively researched for over 100 years, but this line has had little attention from researchers. This particular line begins with my Great-great-grandfather, David Thomas (b. 1820, in Wales, d. 1888) and illustrates some of the issues involved. David Thomas was married three times, first in 1842 to Mary Howells (b. 1821, in Wales, d. 1860), next in 1862 to Adeline Springthorpe (b. 1826, in England, d. 1891) and then in 1871 to her sister Frances Ann Springthorpe (b. 1833, in England, d. 1879). I spent some time researching early church records which contained records of all three marriages. In the records of the marriages in America to the Springthorpe sisters, Adeline and Frances both reported their birth dates exactly ten years later than the English birth records. The remaining information supplied by the sisters is consistent with the English birth records; the parents and places are accurately reported. When were the two sisters born? When do I consider that I have completed a "reasonably exhaustive search" of the existing records? Who else is going to spend the time on this particular line and disagree with any of my conclusions? However, in this case, I have at least three other very able researchers to question my findings and collaborate on the conclusions. I could resort to the currently popular legal jargon and analyze the "evidence" from the records and conclude that the birth records in England "prove" that the sisters were lying about their ages. Or, I could simply report that the discrepancy exists and that my conclusion, based on the available sources, is that the birth records are more reliable than the dates reported by the sisters. As an attorney, it would be very easy for me to make a convincing argument, now commonly called a "proof statement" that the sisters lied about their ages, speculating about any number of reasons this could be the case. What happens when we discover more records figure out that both records are wrong because we have the sisters in the wrong family? My issue is with the implied finality of using legal terminology. Why does it matter whether or not I use legal terminology to express my opinion as to the actual birth dates? I would submit that the main reason for avoiding the quasi-legal evidence and proof concepts is that the research here is open-ended. We are not deciding and closing the case. There is much, much more to the story of this family than a simple issue of the dates of the two wive's births. As I have learned by experience, legal arguments are designed with the intent to conclude the controversy. As attorneys we want to "win" the case, i.e. have the case decided in our clients' favor. This is not what genealogy is all about. We are not researching our families in order to win our case. We are merely investigating historical documents for information and drawing conclusions. There is a need to be careful, accurate and systematic in our research, but in all this I eschew any reliance on a specific type of formality. What is happening today in genealogy is too much like the Supreme Court of Arizona refusing to accept my brief for filing because I have not provided the correct number of copies. Genealogical research begins when we stop copying others and start looking at the records and drawing our own conclusions. To try to impose on this process an adversarial need to prove our case does not add any validity either to our conclusions or our opinions. It boils down to this, why should I care what you think about your family? Why should I have to feel obligated to prove to you (or anyone else) what I think about the history of my own family? So much for my highly opinionated introduction. Stay tuned, if you can stand it, for the next installments. As my collection of digitized genealogical documents and photographs continues to grow, I am periodically in need of more storage space. My current backup files consist of 3.33 Terabytes of data stored on 4 TB drives. Looking ahead, I am always interested in the availability of larger hard drives and check for prices every time I think about the need for a larger drive. Unfortunately, flash hard drives are not yet large enough or cheap enough to be a consideration. I am particularly sensitive the "best price" per Megabyte of storage, although this is going to have to be adjusted to the price per Gigabyte. This go around, I was pleased to note that 5 Terabyte drives are now becoming available and that they now have the optimal pricing. There are 6 TB and 10 TB hard drives but the extra storage space is much higher priced than what would be expected. For example, a 10 TB hard drive is much more expensive than two 5 TB drives. All such considerations are relative. I did some research into the historic cost of computer memory and in 1995, the standard RAM memory in a desktop computer was 8 Megabytes, hardly enough to operate a computer today. The 1995 large capacity hard drive was 9 Gigabytes and cost $2,399.00. (See http://www.jcmit.com/diskprice.htm and http://www.relativelyinteresting.com/comparing-todays-computers-to-1995s/) Today, a Seagate Expansion 5 TB Desktop External Hard Drive USB 3.0 (STEB5000100) is $149.63 on Amazon.com. You can compare this to a Seagate Backup Plus 8TB Desktop External Hard Drive with Mobile Device Backup USB 3.0 for $299.99. The largest hard drive I have seen at Costco is a 4 TB hard drive for about $119. But I haven't seen a 4 TB hard drive on sale at Costco recently in our local store, but the 4 TB drives are still available online. The simple answer to the question in the title of this post is that prices are always coming down as new technology is developed. 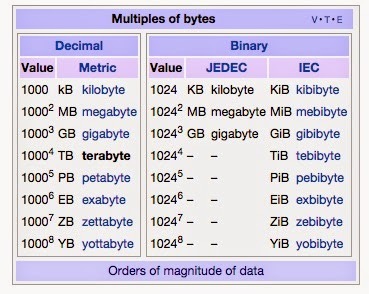 In case you need a reference, here is a chart from Wikipedia: Terabyte, that shows the differences between the different terms used for memory capacity. Most genealogists would never use all of the capacity of a 4 TB hard drive in their entire life, but even though the drives may have that capacity, this does not mean they will last a very long time. Here is a link to an explanation from Seagate about the real failure rate of hard drives: "Hard disk drive reliability and MTBF / AFR." What this means in practical reality is that your drive may fail at any time. For this reason, I maintain two and sometimes three backup drives. I presently have my main internal 2 TB hard drive and three external backup drives. I also copy my primary backup drive periodically and give a copy of the backup hard drive to one or more of my children. My wife's family has always had the tradition of putting flowers on the grave markers of their nearer relatives on Memorial Day. In fact, it was locally called Decoration Day. They also take the time to tidy up the gravesite and clean away grass and such around the marker. Since we have now moved to Provo, Utah, we had the opportunity to participate with others in the family at the Salt Lake City Cemetery. The Salt Lake City Cemetery is on the side of the mountain, just north of the downtown area of the city. It commands a dramatic view of the Salt Lake Valley and on this May day, there were clouds threatening rain and some wind. The Cemetery is rather large and has just over 121,000 burials. Even though Monday is the official day, many of the local people pay their respects on the days before to avoid the crowds. Yes, there are crowds and minor traffic jams at the Cemetery. I probably have dozens, if not hundreds, of relatives buried in the Cemetery of my own and we did take the time to visit my grandparents graves as well as that of one of my Great-grandmothers while visiting the graves of my wife's parents and other close relatives. There is one major challenge in the Cemetery. The streets are set up just like a town with names and addresses for the blocks, but we always have a tendency to get lost since everything looks pretty much the same. This time, we we able to drive or walk directly to the graves using the GPS on my iPhone and BillionGraves.com's App. All I had to do was search for the name of the relative and then tap on the link to the map showing the location of the grave marker. The program was exceptionally accurate and once I got used to moving the right direction, I walked directly to the grave. It was that simple. This happened despite the fact that the rest of those in our group were spread out all over the area claiming to be near the graves. They all finally realized that the program actually worked and subsequent searches were much shorter. In the past, we have relied on waiting in line to get a paper map from the sexton's office, which we always seem to forget or lose by the next trip to the Cemetery. Using the BillionGraves App was a great improvement over tramping around in the mud and wet grass from the recent rains. Between the formal online classes, YouTube videos, and webinars, there is a virtual flood of genealogical information online. I thought it would be a good idea to review the status of some of the offerings. There are obvious networking and social reason for traveling around the country to genealogy conferences, but many of the same people who are presenting at these conferences have either free or paid websites with valuable classes. Here is a sampling of some of the classes and other instructional materials online. In addition, there are organizations that offer university level online courses. Depending on the type of offering, these can be free or fee-based. If you poke around, you will probably find a lot more webinars and more free classes. In my most recent post, I considered the statements made by a Judge in a lawsuit decision concerning Ancestry.com. In the course of writing the Memorandum Opinion, the Judge made some observations about the fact that Ancestry.com may have "saturated the demand" for genealogical products. 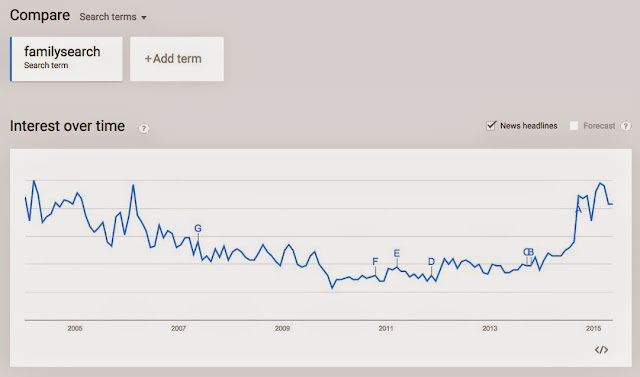 This started me thinking about some similar information available from Google Trends. 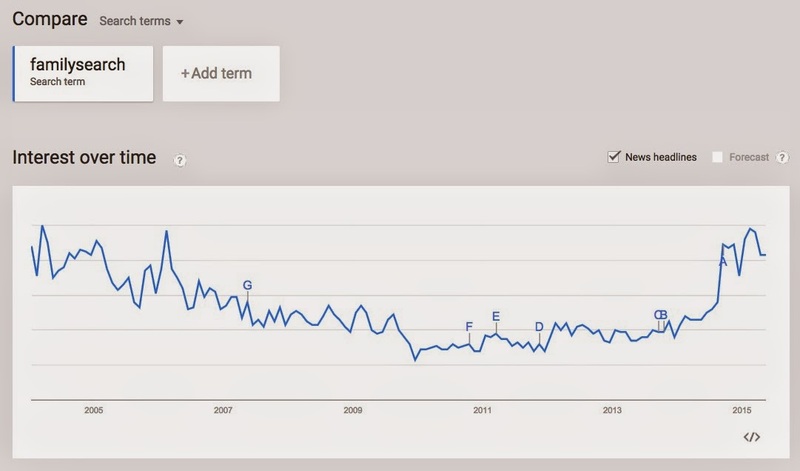 Here is a screenshot of a current graph showing the number of searches done on the term "genealogy" relative to the total number searches done on Google, for the same term, over time. 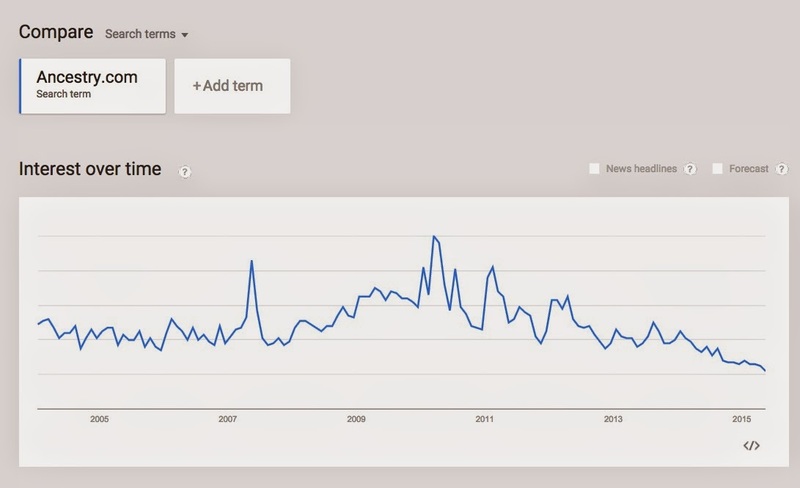 Quoting from the Google Trends website, "They don't represent absolute search volume numbers, because the data is normalized and presented on a scale from 0-100. Each point on the graph is divided by the highest point and multiplied by 100. When we don't have enough data, 0 is shown." What the numbers do show is relative popularity over time. To further quote Google, "A downward trending line means that a search term's popularity is decreasing. 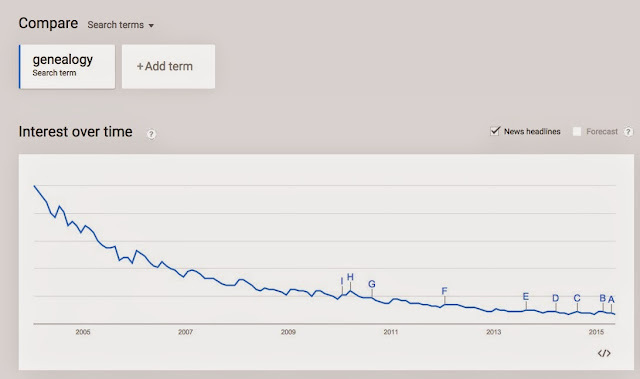 It doesn't mean that the absolute, or total, number of searches for that term is decreasing." 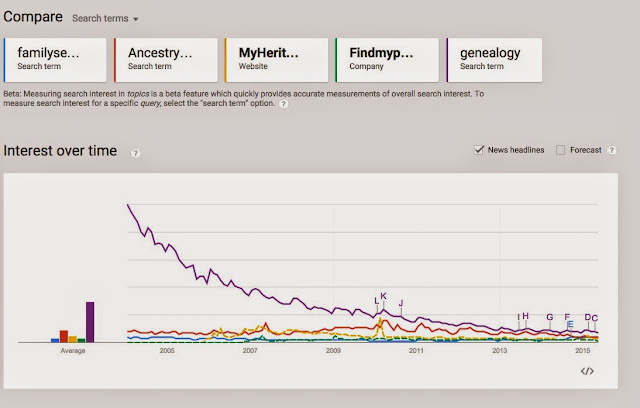 Ancestry.com has traditionally been much more popular than FamilySearch. But now, they are running almost equal and both are trending down. From this graph, it doesn't look like to me that FamilySearch was posing any kind of threat to Ancestry. com until very recently. It certainly does not look like anything FamilySearch has done with reference to Ancestry.com has played a part in the future. 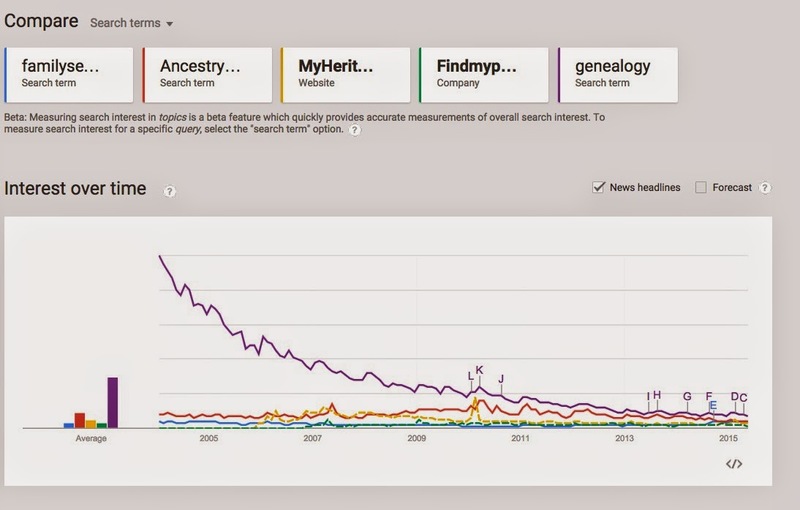 You would have to do quite a bit of talking to convince me the topic of genealogy and any one of the big websites were becoming more popular. 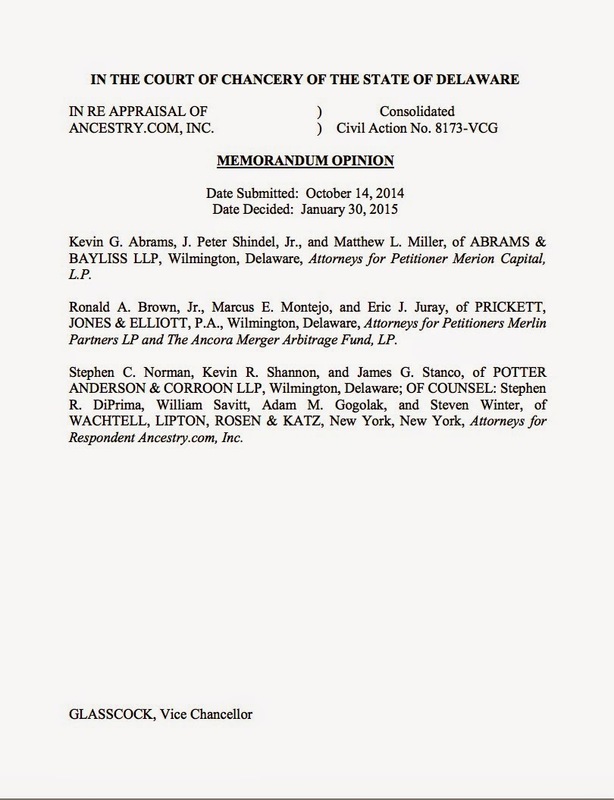 Within the last few months, the Chancery Court of Delaware issued a Memorandum Decision in the a case entitled, "In re Appraisal of Ancestry.com, Inc." This 57 page document gives some valuable insight into the inner workings of the large online genealogy companies. The subject of the Court's opinion would normally only be of interest to very sophisticated investors, but the subject matter, Ancestry.com, Inc. has just been in the news because of speculation of another sale of the company. The more recent news release by Reuters.com, mentions that Ancestry.com, Inc. is contemplating an "auction" sale. You can see from the above legal Memorandum that the lack of such an auction sale was the basis for a lawsuit concerning the valuation of the company when it was purchased by its present owner, Permira Advisors, LLC. Since the company is presently privately owned, some of the previous issues regarding a fair price paid to stockholders will not likely be publicly aired. The Court Memorandum gives a brief, but insightful, analysis of the more recent history of Ancestry.com, Inc. and opens up so perspective to genealogists about the business side of these companies. I especially liked the comment the Court made about the subscribers to Ancestry.com and comparing them to a "hamster wheel of new people coming in and people existing at the same time." Ancestry faces several competitive forces, including a number of start-up companies and an increasing amount of free archived information more readily accessible by internet search engines. Additionally, the Church of Jesus Christ of Latter Day Saints operates a website that has resulted in a ―competitive dynamic for Ancestry. 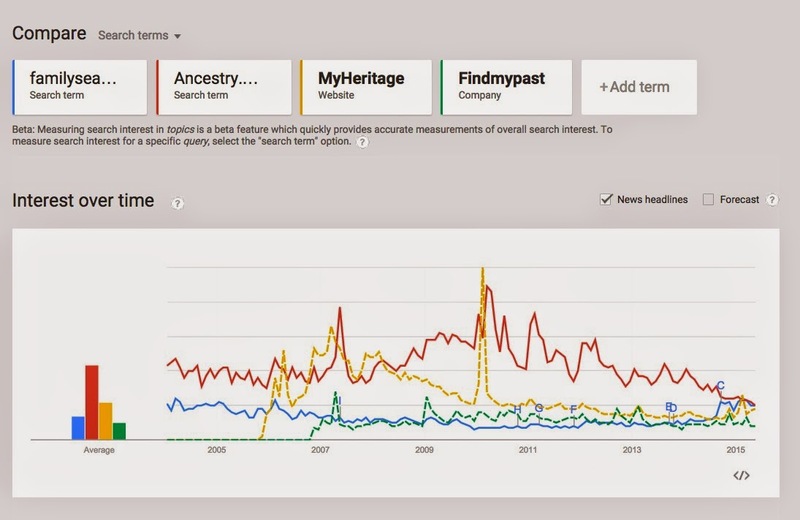 The website, FamilySearch.org, provides free online access to some of the Church‘s extensive resources—the Church has aggregated ―what's recognized as the world's largest collection of data and content that would be valuable for people researching their family history. This collection previously enticed interested individuals to travel to Salt Lake City, but the FamilySearch.org website has begun digitizing the collection and ―includes a lot of the same features and functionality as Ancestry.com. Well, I do think that the FamilySearch collection of data, still "entices" people to travel to Salt Lake City, Utah, just as I did yesterday, but I am surprised that the Court viewed FamilySearch and Ancestry.com as "competitors." The availability of a free source for some documents may have an effect on the price people are willing to pay for additional documents and services, but I do not view a free website as being in competition with any of the subscription websites. I think it also interesting that the Court failed to note the existence of all of the other Ancestry.com websites, including its "free" websites such as FindAGrave.com and RootsWeb.com. At an April 19, 2012 board meeting, Qatalyst Partners (―Qatalyst), a financial advisor, made a presentation to Ancestry‘s directors. 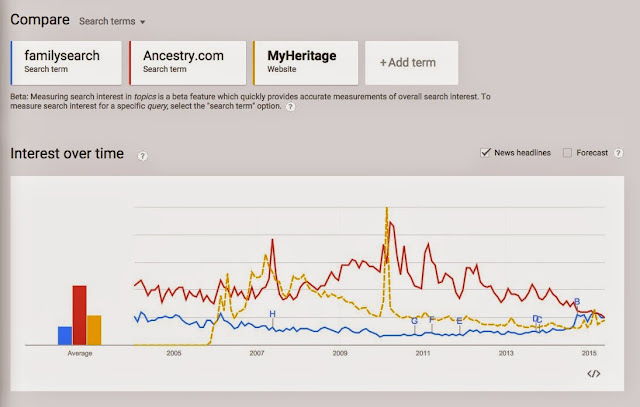 In this ―state of the union presentation, Qatalyst raised as among its concerns that Ancestry ―was getting people that were less engaged in the hobby and who would not maintain their subscriptions, though the Company‘s subscription base had been growing as a result of Who Do You Think You Are?. There are only so many people who are interested and have the time to be able to devote a significant amount of their free time to genealogy and using the company‘s product and be willing to pay for it. And that was a—that was a concern because once the company hit . . . single-digit millions of subscribers, at this point the business was largely U.S. with a little bit of—a little bit of U.K. How many people left are there? These opinions seem to fly in the face of the promotional statements made by those who work for and support the large online database companies. I am also surprised at these statements that seem to ignore the number of members of MyHeritage.com which, according to the website today, has over 76 million members compared to Ancestry.com's 2 million or so subscribers. You may want to review the Memorandum yourself and draw your own conclusions. The Family History Library in Salt Lake City, Utah is 50.4 miles from my home in Provo, Utah. On a good day, using the freeway, I can drive from home to the Library in about an hour. Of course, when I get to the Library, I have to figure out where to park and so the actual time is more like an hour and a half. For an alternative to driving, I can drive for seven minutes to the Provo train station and ride a train to Salt Lake in an hour. I can then take the local light rail TRAX right to the corner by the Library. No parking. No freeway. This takes about an hour and forty minutes, depending on the schedule and if I hit the train at the right time and don't have to wait. Today, that trip will take me about two and a half hours because I missed an earlier train and had to wait an extra half hour. But the train has WiFi and electrical outlets and I am writing this post, in part, while traveling on the train. What if I walked? According to Google, that same trip (a little shorted by a more direct route, would take me 14 hours and 46 minutes. I suggest that I could probably walk, at most, about 20 miles a day and so, in reality it would take me more than two full days of walking. If I could only make 10 miles a day, the trip would start to stretch out onto four or five days. That would require camping out or finding hotels or motels at the right distances to stop for the nights. How many times would I make the journey if I had to walk? Of course, I would not be able to do much else than walk while I walked. In fact, after twenty miles or so, I might not be able to do much more than sleep. The point is simple. Most of our ancestors did not have cars, or trains, or WiFi, or need parking spaces. This may seem obvious, but I often find a distinct lack of perspective in the claims about how, when and where their ancestors lived, got married, and then died. For example, I have had people add children to a family living in the United States that were born in England. Is this possible? Yes, theoretically. But when did this family live? Many times I see this claim for families that lived in the mid- to early 1800s. The time it took a sailing ship to cross the Atlantic could vary from about 6 weeks to almost 6 months. The Mayflower, for example, took 66 days (See Voyage of the Mayflower) and remember, there was no communication available from America back to England other than turning around and sailing back. So, the passengers' relatives and friends in England did not even know if they had made it to America for many more months. In fact, the Mayflower passenger spent much longer on the ship simply waiting to leave. 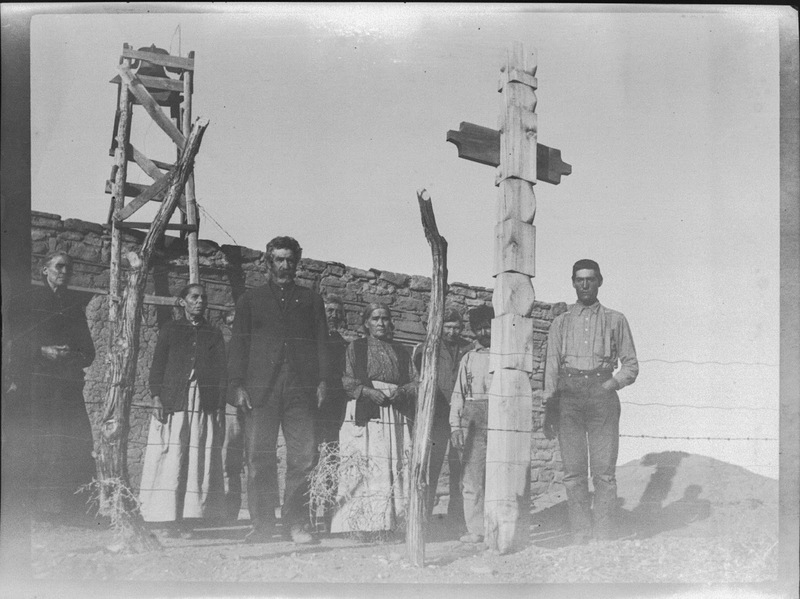 Some of my ancestors lived in Northern Arizona during the late 1800s. To return to Southern Utah to visit relatives or for marriages in the LDS Temple in St. George, the journey could take more than three weeks, one way. I can drive the same distance today in a few hours. 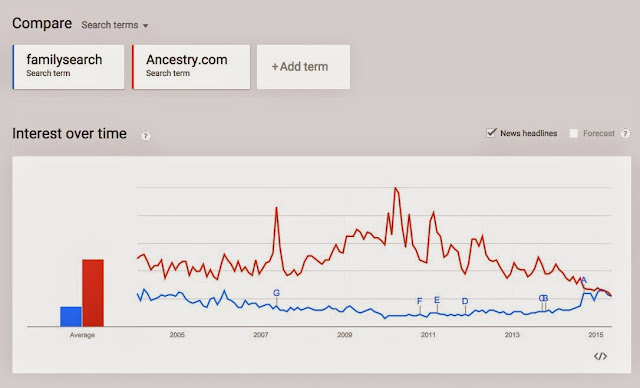 What does this all mean for genealogical research? The answer is plain. As we got back in time, we need to adjust our perspective. A man and a woman who we find and claim as ancestors may have lived in two different towns. The towns may only have been 50 miles apart, but that fact raises a question as to how they became acquainted? What contacts did the two towns have? Why would they have visited the other town? When I was a teenager living for the summer in a small town in Eastern Arizona, I was talking to an older girl in her 20s and she informed me that she had never been outside of the town. She had never been the 45 miles to the next, much larger, community in her whole life. Even then, I thought this strange, but it would not have been that unusual for many of our ancestors. When you start doing genealogical research, adjust your thinking to the reality of the time period when your ancestors lived. Take the time to think about your conclusions and make sure they reflect the reality of the time it took your ancestors to travel from one part of their world to another. Identifying places is of the highest priority in doing accurate genealogical research. One of the phenomena of our age is the ability we have to "pass along" posted information almost instantly. When we see a cute or attractive photo, we can "share" it by simply clicking a link to Facebook or some other social networking website. In addition, many online genealogy websites have provisions for uploading photos and making them available online. I recently wrote a post about where to find free genealogical images online. But after some consideration, I decided that it would be good idea to followup with a post about why some of these images are not freely usable. Back in 1886 a multi-national agreement concerning copyright was signed in Berne, Switzerland. This agreement is known as the Berne Convention and applies to the signatory countries. The United States did not ratify the Berne Convention and become a signatory until 1989. That's right. It took the United States more than a hundred years to accept the agreement. The main provision of the Berne Convention, now enforceable in the United States, is that copyright protection becomes automatic and any requirement for formal notice is prohibited. This agreement applies to all of the Berne Convention signatories. See the list from the World Intellectual Property Organization. This means that any "work" as defined by the U.S. Copyright Law becomes automatically covered without any notice. It is not necessary for the work to have the copyright symbol or any mention of copyright to be protected. The term of the copyright is determined by the country of origin. So why are people able to republish photos and other content on the Internet? This is a really interesting question. You cannot assume that an image that is being "passed around" on the web is not legally subject to a claim of copyright. This is doubly the case if you find an image on someone's website. In fact, you must assume that the document is subject to a copyright claim unless there is specific information to the contrary. The Digital Millennium Copyright Act (DMCA) is a United States copyright law that implements two 1996 treaties of the World Intellectual Property Organization(WIPO). It criminalizes production and dissemination of technology, devices, or services intended to circumvent measures (commonly known as digital rights management or DRM) that control access to copyrighted works. It also criminalizes the act of circumventing an access control, whether or not there is actual infringement of copyright itself. In addition, the DMCA heightens the penalties for copyright infringement on the Internet. A complete copy of the legislation can be found on the Copyright.gov website. So what if I have an image and I do not care about copyright protection? How can I notify the world that they can use my image without worrying that I will send them a nasty letter? There are various ways to legally release all or part of your copyright interest in any work. One of the most commonly used methods for works on the web is the use of the CreativeCommons.org. If you post a work on the web, you can retain your copyright, but at the same time, you can specify a less restrictive use policy. You can do this for your whole website or for individual documents. You will need to go to the CreativeCommons website and spend some time studying the different levels of license that you can give to those who use your work. If you are trying to find public domain images or other works on the web, be sure to look carefully at the content. If the image appears on a webpage without any indication of copyright or license, it is protected under copyright and it would not be a very good idea to assume otherwise. In other words, you must have a positive assertion that a document, image or any other work has been released from its copyright either due to a specific license or the passage of time. As the online genealogical community continues to grow and evolve, we need to sometimes remind ourselves of the our more humble online beginnings. What is more important is that some of these humble beginnings are still with us and have grown and become even more valuable. I would like to take a short trip down memory lane and point out some of the online golden oldies of genealogy that still need to be used and remembered. To understand and gain an appreciation of what this one person has done for genealogy, you need to read the section that talks about Cyndi herself. If you haven't used this resource or even if you haven't used Cyndi's List lately, I suggest it is time to get back to using this valuable and comprehensive list of genealogy websites. I just wrote about Archive.org very recently and so I will defer to my previous post about the details. The Internet Archive or Archive.org was founded by an American computer engineer named Brewster Kahle. See Wikipedia: Brewster Kahle back in 1996. The Internet Archive is still going strong and although it is not specifically genealogical resource, the information in its massive digital files is extremely interesting and helpful to genealogical researchers. The mission of the Internet Archive is to provide "universal access to all knowledge." See Wikipedia: Internet Archive. I would suggest that if you are not familiar with this website, you certainly should be. Another of the old websites that still keeps plugging along is Rootsweb. This website also dates back to the early days of 1996 (or even before). However, the website was purchased by Ancestry.com in 2000. It is a "free" website and has a huge amount of genealogical information. Originally, it was one of the foremost methods of posting genealogical requests for collaboration and help. It is still a very useful website if you ignore all the advertisements. This list could go on. There have been some very persistent online blogs for example. If you have an old-time favorite, post a comment and let us know about it.